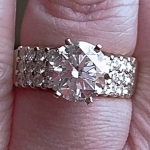 Please See Video of this beautiful ring! 2.13ctw Ceylon Blue Sapphire & White Sapphire Ring set in 10K Yellow Gold. Original Certificate Of Authenticity is included. Gorgeous vivid blue color saturation on the Ceylon Blue Sapphires! Was a size 9 resized to an 8, Just picked up from my jeweler! Limited Edition-1 of 28 ever made! Like New Condition..